GALLOWAY, N.J., Feb. 28, 2014 – Dynamo Recreation Center will host a special needs open gym on March 8, from 12 p.m. to 1 p.m. The event is a great opportunity for children to interact with others by engaging in fun fitness activities. The free open gym time is for children with special needs including but not limited to Autism, PDD-NOS, Aspergers, Down Syndrome, Cerebral Palsy, ADD and ADHD. Siblings are welcome, and a parent or caretaker will be required at all times in the gym to accompany their child. Melissa Connahey, one of the coaches, said at the last open gym every kid and parent was laughing and having a good time. Children will enjoy an hour in the gym, to run around, jump on the trampolines, play in the in-ground foam pit and more. 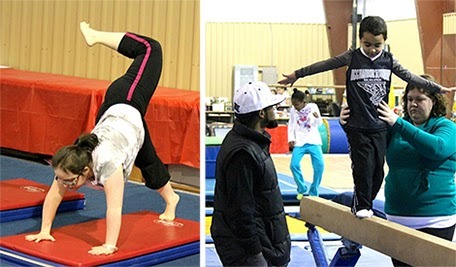 Dynamo has hosted special needs open gyms in the past, and brought them back in January. The staff is very excited about the program’s return. The center has received positive responses and many requests to offer even more activities. There is a high demand in the area for activities open to physically and mentally disabled children, and the center is welcoming families with open arms. The staff is in the process of creating gymnastics classes designed for the children. The sole purpose of Dynamo’s friendly staff is to make sure families have a wonderful experience, as well as a fun and safe place to come back to. 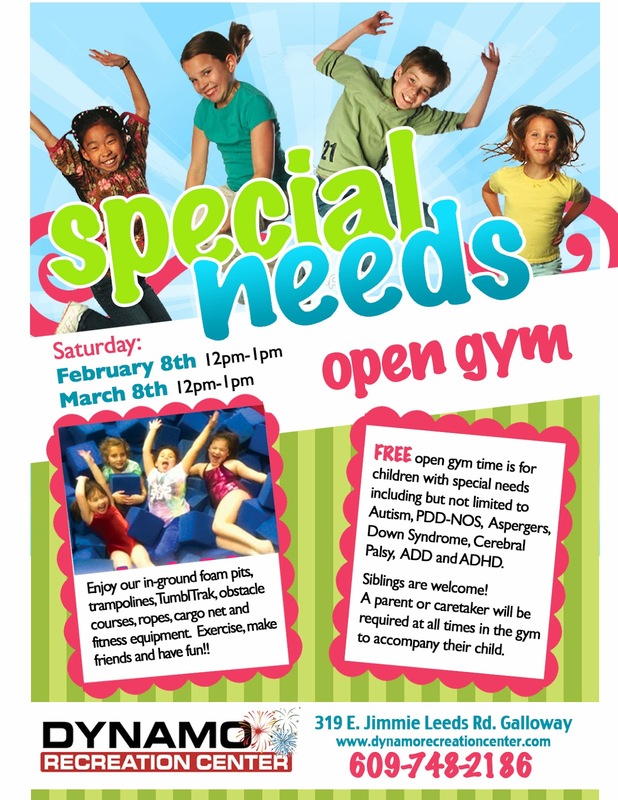 For more information on Dynamo Recreation Center and the Special Needs Open Gym, please call 609- 748-2186. Dynamo Recreation Center, located in Galloway, NJ, is a state-of-the-art facility offering gymnastics, cheerleading, dance, karate, and parties. The center strives to cultivate a community focused on fitness, health, and wellness through offering several different fitness related activities under one roof. For more information on Dynamo Recreation Center, call 609- 748-2186 or visit http://www.dynamorecreationcenter.com.